THE decision to transfer Knaphill’s ambulance crews to a station six miles away has been condemned by a widow who called the service to her husband several times as he neared the end of his life. Tina Smith fears the emergency vehicles will take too long to reach people in and around the village who need lifesaving treatment after the move. “During the end of my late husband’s life a couple of years ago, I had to call for an ambulance on several occasions, all of which came within a matter of minutes,” said Mrs Smith. She is also concerned at the lack of public consultation by South East Coast Ambulance Service NHS Foundation Trust on its intention to close the station in Guildford Road, Knaphill, some time at the start of November. The Knaphill staff will then be based at Chertsey Ambulance station in Ottershaw, a regional centre which operates the service’s new Make Ready system. This frees up ambulance crews from having to spend time cleaning and restocking their vehicles with medical supplies, as this is done by specialist teams. 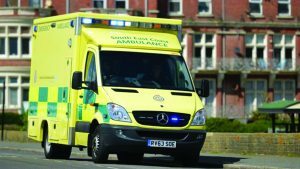 The ambulance service says the former Knaphill crews will operate from several ‘emergency response and standby points’ including Woking Community Hospital. But Mrs Smith said: “The Knaphill station is in a prime location to cover Knaphill, Brookwood, Bisley, West End, Bagshot, Windlesham, Goldsworth Park, Pirbright and Worplesdon, along the main Bagshot Road. The move will affect more than 25 staff at Knaphill, who operate four ambulances and one response car. “I have heard from a few staff at the station that they are all feel bullied and are very upset, frustrated and distressed by SECAmb’s decision, which has been forced upon them, and on such a short timescale too,” Mrs Smith added. The ambulance service says the Knaphill station is not in the right location for current ‘patient demand’. The Make Ready system is said to minimise the risk of cross-infection and frees up front-line staff to spend more time treating patients. It also keeps ambulances on the road for longer.